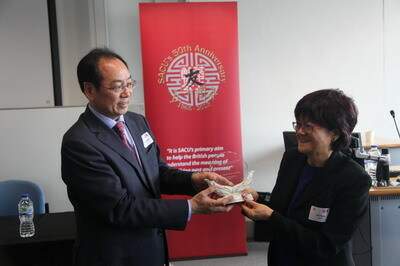 On 30 May, 2015, the 50th Anniversary Celebration of the Society for Anglo-Chinese Understanding (SACU) was held at King's College London. 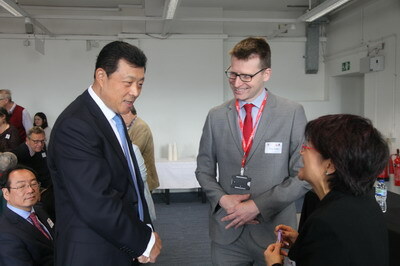 Chinese Ambassador to the UK Liu Xiaoming was invited to attend the event and to deliver a speech. More than 150 guests, including SACU Chair Zoe Reed, Vice President of the Chinese People's Association for Friendship with Foreign Countries (CPAFFC) Song Jingwu, and scholars from Peking University, the Needham Research Institute of Cambridge, University of Oxford, King's College London, the London School of Economics and Political Science and other institutions, were present at the event. Ambassador Liu congratulated SACU on its 50th anniversary and highly appreciated its contributions to promoting China-UK relations and mutual understanding between the two countries over the past 50 years. The Ambassador said, "back in the 1960s, the cold war between China and the West was raging. China and Britain were yet to have full diplomatic relations. But it was right then that a group of like-minded Britons demonstrated extraordinary political courage and foresight. Resolved to break through the thick icy barriers of the cold war, they founded the Society whose 50th birthday are celebrated today. Over the past 50 years, SACU has been committed to better understanding between China and Britain, and between our two peoples. You have worked hard to clear away misunderstandings and bias. You have organized exchanges of visits between the two countries. You have been sharing stories of the real China with the British public. Between China and Britain, and indeed between China and the West, you are an important platform for understanding and a channel for exchanges and cooperation. 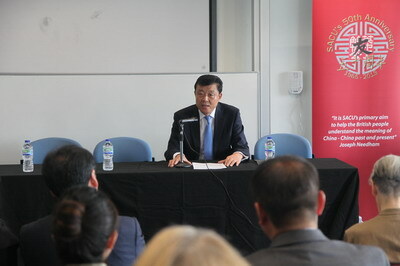 What you have done has an important place in the history of China-UK relations". Ambassador Liu noted, "50 years on, the international landscape has changed profoundly. China in this new landscape has changed beyond recognition and continues the dynamic change with each passing day. China-UK relationship has also made a quantum leap". "Exchanges between the Chinese and British people are closer than ever, deeper than ever and more extensive than ever. However, 'understanding' remains a major subject between China and Britain, and indeed between China and the West. Old misunderstandings and biases may have dwindled but they are replaced with new ones. To build Anglo-Chinese understanding – and indeed to increase understanding between China and the West – remains a long and arduous task". "Understanding is the foundation and precondition for building stable comprehensive strategic partnership between China and the UK in the long run. Only deeper understanding fosters deeper mutual trust; only deeper mutual trust generates deeper cooperation". He hoped that SACU will be fully committed to advancing China-UK understanding and friendship, to building the edifice of Anglo-Chinese understanding and to writing a new chapter for a better and brighter future of China-UK relationship. In his speech, Vice President Song Jingwu extended warm congratulations to SACU on behalf of CPAFFC President Li Xiaolin. He recalled the historical ties and friendly exchanges between CPAFFC and SACU, and highly praised SACU's efforts of promoting mutual understanding between China and the UK and deepening friendship. He presented, on behalf of CPAFFC, a commemorative plate to SACU Chair Zoe Reed in celebration of the Society's anniversary. With passionate words, vivid pictures and detailed and moving stories, Ms. Reed, scholars from relevant British organizations, colleges and universities and members of SACU reviewed the extraordinary history of SACU over the past 50 years and shared their ideas. They pledged to continue to play a positive role in promoting understanding between China and the UK. SACU was founded in May 1965. Its first Chair was Dr. Joseph Needham, renowned sinologist and author of Science and Civilisation in China. The Society has been committed to promoting understanding between China and the UK ever since, actively organizing exchanges of visits between two countries and making important contributions to China-UK exchanges.